Senior-level buy- and sell-side traders, institutional investors, portfolio managers, brokers and dealers of investment firms. The Journal of Trading (JOT) offers in-depth analysis of new tools and strategies in institutional trading and demonstrates how to use them in a practical way. The JOT aims to provide critical intelligence on algorithmic trading, pre- and post-trade analysis, liquidity issues, trading platforms, best execution, research strategies, and analytical models. Themes frequently covered in the JOT include assessing trading strategies, measuring trade execution performance, analyzing transaction costs, evaluating commission allocations, and avoiding trading pitfalls. 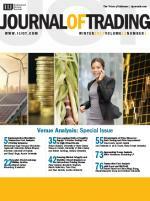 The Journal of Trading was launched with the mission of educating investment professionals by providing critical knowledge and in-depth analysis of the latest strategies and trends in institutional trading. The Journal of Trading aims to be the leading journal where trading experts publish papers on market structure and trading techniques. In 2006, Institutional Portfolio Research Journals launched The Journal of Trading, following the success of its highly acclaimed series, The Guide to Algorithmic Trading, and The Guide to Liquidity. Read the inaugural editor's letter here.